Reiki for happiness? Who would have thought it? In fact, Mikao Usui, who first taught the Reiki Method of Natural Healing in Japan in the 1920s (after an experience of enlightenment during a meditation on Mount Kurama), did believe that Reiki offers not only deep relaxation, relief from pain, and profound healing, but also a way to peace of mind and happiness. He encouraged those he taught the Reiki method to meditate on a set of five statements for right living, which Western Reiki practitioners and teachers call "The Reiki Principles" or "The Reiki Ideals." 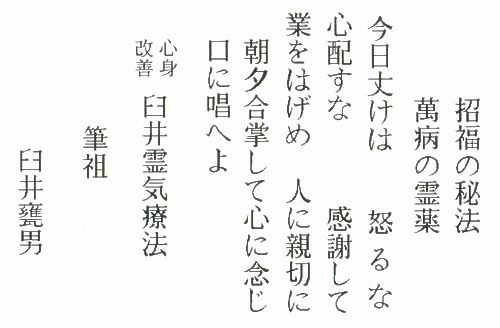 However, Mikao Usui gave these statements a much more thought-provoking double title, which translates from the Japanese as follows: "The Secret Method of Inviting Happiness / The Miracle Medicine for All Diseases." 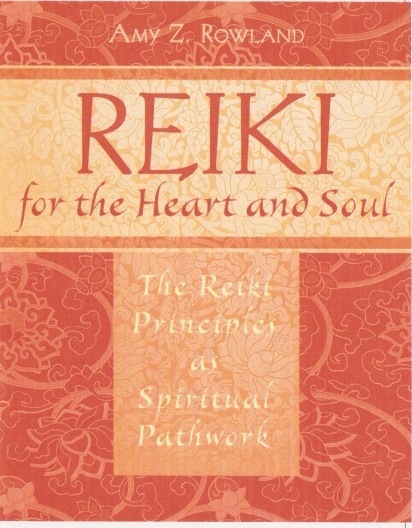 Reiki for the Heart and Soul: the Reiki Principles as Spiritual Pathwork (ISBN #978-159477252-8) invites Reiki practitioners and teachers to reconsider the value of the Reiki Principles in Reiki client practice and in their daily lives -- and to claim their power to bring happiness. The book begins by describing how the Reiki Principles are presented in most Western Reiki classes, with little emphasis, in contrast to their presentation to Reiki students in Japan, who are taught to make them a focus of twice daily meditation. Then the book offers some of the translations that are available, including some from traditional Reiki classes taught by the first Western Reiki Master, Hawayo Takata, and Reiki Masters she initiated, as well as recent translations of the more complete text of the Reiki Principles, which have only been available since the late 1990s. This more complete text, called "the Gainen," includes Mikao Usui's double titles and his recommendation to use the Principles in daily meditation. What do we gain from giving the Reiki Principles greater consideration? Stories in the chapters that follow offer both encouragement and insight into how liberating and uplifting it can be to live by the Principles: to choose peace instead of anger, serenity instead of worry, gratitude and appreciation even in the face of life's difficulties, integrity, and kindness. Yet perhaps the greatest reward for making the effort to live by the Principles is that it reveals more to us about our essential spiritual nature. As our understanding deepens and evolves, we become more consciously aware of our constant connection to the Source of Reiki and of all life. This is a spiritual comfort. The book concludes with a chapter on the double titles and a reminder of the pleasures of the path of Reiki. Not only do Reik practitioners and teachers sometimes have the chance to witness miracles of healing, but we are also invited to enjoy the clarity, the contentment, the joy and the happiness that settle in the heart and uplift the soul when we give the Reiki Principles a more central place in our lives. Again, there are stories to suggest the power of the Principles to guide and to inspire us, not only during conscious practice of hands on and distant Reiki healing, but throughout the day, as we go about our "ordinary" lives, each step before us lighted by the "Great Shining Brightness" that is Reiki. Gratitude is a bit like New York's Grand Central Station. You can get there from almost anywhere and arrive in any condition, but once there, you can change trains. If you've arrived on a mental and emotional train of anger and frustration, you can get off and go into gratitude, spend a little time there, and in a half hour or so, catch a different train for that desirable country location, peace of mind. If you've arrived on a train of anxiety, worry, and fear, you can go into gratitude, find some refreshment, and, when you are ready, leave on foot, feeling calm and optimistic once more. Gratitude has the capacity to transform our experience in a positive way in a very short time. We may gravitate toward it naturally in crisis, or we may not, but even if not, we can still choose to enter gratitude. It can be a way station that we pass through on our way to another feeling, or it can be a destination in itself. Reiki practitioners are going to love this book. It explores how the principles of Reiki can be used for more than healing. They can also be used for spiritual growth. Using many stories of clients, other practitioners, and the founders of Reiki, the author explores how to practice the Reiki values of peace, serenity, gratitude, integrity, and kindness in everyday life no matter what might be going on. There are exercises and meditation that will assist in deepening the practice of Reiki using the five Reiki precepts: do not anger, do not worry, be grateful, do an honest day's work, be kind. Whether you use Reiki only for yourself or if you have clients, you will treasure this book and the energy it carries. It brings the practice of Reiki to your daily life in a practical and grounded spiritual way. We have moved into a time when many people who have been studying, practicing, and teaching spirituality and energy work are suddenly finding new doors that open up deeper levels of personal understanding. Fortunately, many of them are putting these discoveries into print. This book focuses on the deeper spiritual levels that exist within the practice of Reiki. As someone who was attuned to reiki almost two decades ago, I was delighted as I read Amy Rowland's discussion of it as spiritual pathwork. Like all advanced spiritual work, the pearl she found in the heart of reiki is a simple one, and it has been out in the open from the beginning. That pearl is summarized by reiki's discoverer, Mikao Usui, as the Five Reiki Principles (which are given to every practitioner of traditional Usui reiki). He asked simply that practitioners meditate on them daily and that's exactly what Rowland did. her account of what she has learned is written clearly, directly, and with a sense of joy. "Reiki for the Heart and Soul is a gift to us from a remarkable woman who lives and breathes her work. The book literally loves us into each and every precious principle, weaving its magic as we read, bringing us into a deeper understanding. I feel it should be required reading for all dedicated practitioners and teachers." "This excellent book shows how the five Reiki principles can be used for personal development and spiritual growth. Suited to practitioners of every level, it is packed with insights and techniques invaluable to anyone wishing to deepen their understanding and practice of Reiki." "Amy Rowland's compassionate journey into Usui's world offers the reader a catalyst for a deeper connection with Usui the man and his Way of Being. She has created a work that has captured the very essence of his spiritual teachings, creating a bridge between Eastern and Western Reiki teachings." "Amy Rowland elegantly and eloquently shares how we may each walk our talk by offering riveting, real-life examples of how present-day Reiki Masters and esteemed Reiki masters of the past have utilized, and continue to utilize, the Reiki principles in a dynamic and living way, every day. This is a must read for humanity!" "This is a well written Reiki book that weaves together many important details with a wonderful spiritual sentiment. It grounds one in the here and now and inspires practitioners to look deeply into their own healing and to help others." "A joyful read! Amy Rowland provides a heartfelt guide for living Reiki in our daily lives. This book will help you open to Reiki as a spiritual path." "Amy Rowland has once again written an invaluable and insightful book. Reiki for the Heart and Soul not only provides an excellent overview of the Reiki system but also explores, for the first time, the Reiki principles from a place of depth and authenticity. This book exemplifies the very essence of Reiki and provides us with a map of how we can genuinely use these teachings for the betterment of ourselves and humanity." "An in-depth book on the principles of Reiki and mindfulness of their values recommended both to newcomers and established practitioners." Send a check or money order for $19.95 per book, plus shipping and handling charges ($4.50 for the first book and $1.00 for each additional book) to Inner Traditions, P.O. Box 388, Rochester, VT 05767, indicating the book's title and ISBN #978-159477252-8 on your check. If you are a Reiki Master who wants to make this book available to your students, please call Customer Service at 1-802-246-8648 and mention your intention to learn about special discounts on orders for multiple copies. Please visit Inner Traditions to view other books on healing and spirituality offered by this publisher. Monique Chapman, executive producer and host of "Walking with Spirit," America's premiere metaphysical and personal growth radio show, interviewed Amy Rowland, author of Reiki for the Heart and Soul: the Reiki Principles as Spiritual Pathwork, live on Tuesday, November 10, 2009, from 5-6 p.m. Pacific Standard Time, on The Achieve Radio Network. This show is archived. Tune in to hear more about the power of practicing the Reiki Principles in these challenging times. Peace of mind can be a choice. Gratitude can be a centering meditation. Practicing integrity can heal wounded self-respect. Kindness can uplift and inspire us all. To learn more about Monique Chapman's spiritual insight into everyday life, visit her blog, moniquechapman.wordpress.com. Hear Rob McConnell, host of "The X Zone", a late night Talk Show Radio Network program on the paranormal and parapsychology, who interviewed Amy Rowland about traditional Reiki and the value of the Reiki principles in everyday life by downloading the podcast of the March 4, 2009 program from "The X Zone" website. This live interview was broadcast and streamed worldwide out of Toronto, Ontario, Canada. Thank you to the Berks County Women's Commission, and especially Shirley Dauttrich and Deb Deischer, who organized a booksigning on Sunday, November 8, 2009, at the Goggleworks Center for the Arts in Reading, PA. It is a pleasure to be showcased as a Berks County author. Thank you to Judith Ellmer, who organized a book signing, and Elaine M. Prendergast, who hosted the book signing at Wellspring Center" in Merchantville, NJ, on February 21, 2009. Amy Z. Rowland lives in southeastern Pennsylvania, in rural Berks County, with a view out her north window of farm pastures and low rolling mountains. As a child, she attended both public and parochial schools, but also counts walks in the woods as contributing greatly to her real education and knowledge of the world. She attended Bryn Mawr College as an undergraduate, worked for ten years as a secretary, copywriter, and book editor, then returned to school to pursue a Masters degree in English: Creative Writing at Temple University. She received her M.A. in 1987, just two months after learning Reiki hands on healing from Hawayo Takata-trained Reiki Master Beth Gray. The Reiki class with Beth Gray changed the course of her life. For more about her journey as a Reiki practitioner and teacher, visit About Amy Rowland. In addition to writing three books about Reiki for Healing Arts Press, an imprint of Inner Traditions, Amy has also written two trade nonfiction books about architectural crafts for Rodale Press, two children's books for Childswork/Childsplay, and magazine articles on a wide variety of subjects, from antique lace to weight-lifting. She feels called to teach Reiki and to write. She is currently at work on a novel for young adults in which dragons play a very important role. She lives with her father, who is a woodcarver, and three happy cats. Special thanks to Dave King, who kindly granted permission to post the image of the "Gainen," the Reiki Principles in Japanese, that you see on this page and who created an even more beautiful image of the Gainen for the book; to Connie Bell-Dixon, who shot the black and white photographs used in Reiki for the Heart and Soul and most of the landscape photos you see on the pages of this website; to Lauren Bissett and Albert Seaman, who modeled for the photos in the book; and to everyone at Inner Traditions who worked in harmony and with integrity and kindness to bring this book to you, with a sense of sharing in life's many blessings. Web site design and text ©1998-2019 Amy Rowland. 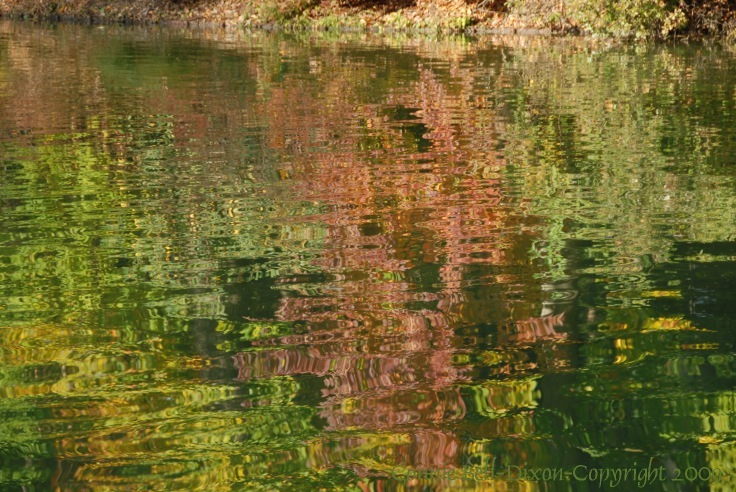 Rippling water ©2009-2019 Connie Bell-Dixon.